Vincent Grech, local artist and interior finisher, has been chosen to paint two Globes for the city of Chicago. 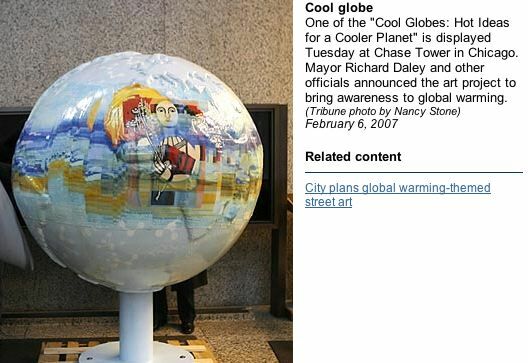 Like the "Cows on Parade"
all around Chicago that were done in the summer of 1999, these globes range from either one-foot to five-feet in diameter and will be displayed throughout Chicago to promote Global Warming Awareness. This particular theme is meant to have the globes show each individual's different take on global warming, ranging from thoughts on how to prevent it to the things it does to the earth. Vincent's five-foot globe was just received Wednesday, March 21st and needs to be completed by May 1st. This is an open invitation for reporters and photographers. Come by and watch the process of how one of these five-foot globes w/ embossed land is completed from beginning to end. More information can be given upon inquiry. To set-up an appointment, please contact Vincent at 773-412-0957, 773-384-1313 or at Vince@vincentgrech.com. For more information on Vincent, please visit www.vincentgrech.com.